A good leader takes a little more of the blame and a little less of the credit. Read about Stanford's Jamila Wideman and her high school team from Amherst, MA. They were a talented team with a near-perfect record but a reputation for choking in the crunch of the state playoffs. Finally, after five straight years of disappointments, the Amherst Lady Hurricanes found they just might have what it took to go all the way. This is a fierce, funny, and intimate look into their minds and hearts during one very special season. A finalist for the National Book Critics Circle Award for nonfiction. Click the book to the right to visit Amazon.com, the internet's largest bookstore, where you can purchase "In These Girls, Hope is a Muscle". We require each member of our Lady Vol basketball team to know our "Definite Dozen" and commit to honoring each one. If you will use this "Definite Dozen" as a guideling for everyday living, you will not only become a better basketball player, but a better person. Pat Summitt has been called a living legend. 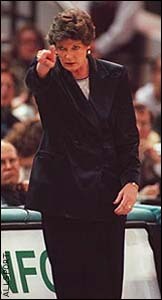 As head coach of the University of Tennessee Lady Vols, Summitt has taken her NCAA Division 1 women's basketball team to back-to-back national championships in 1996 and 1997, and five titles in a 10-year span. In Reach for the Summit, with the help of former Sports Illustrated writer Sally Jenkins, she draws from 24 years as a successful head coach to provide motivational advice for anyone who wants to succeed in sports, business, and life in general. Click the book to the right to visit Amazon.com, the internet's largest bookstore, where you can purchase "Reach for the Summit". It's supposed to be hard. If it wasn't, everyone could do it. It's the hard that makes it great. 10. After you practice and your muscles are tired, you feel happy because you know you are getting better. 9. All you want for your birthday are the new AirSwoopes shoes. 8. Your friends think the basketball is an extension of your hand since you always seem to have it around. 7. You don't mind studying since you know no college will take you if you are not a success in the classroom. 6. You give up a night to go out with friends and instead stay home to practice. 5. You eat right and try to stay healthy. 4. You practice in all kinds of weather, even in the hot summer sun or cold winter days (Mom is not too crazy about all your gloves being fingerless). 3. You love to talk about basketball. 2. Your wardrobe looks like you own stock in Reebok. 1. You love to play basketball. As you look over my list, you may think that maybe you are not as committed as I am. Well, remember, that this is just my opinion. For some, "Basketball is Life". For others it is just something to do in your free time. The true beauty of basketball is that it has different meanings to different people who feel it is fun to do in your spare time. That's fine, that is what rec and intramural leagues are for. But maybe you are one of those people who dream about playing in college. You work on your moves and dream about the seasons to come. Your friends think you are crazy, because while they are dreaming about who they are going to marry, you dream of trying to be the next Rebecca Lobo. You then come back to earth and think that this probably will never happen, but you have to remember anything is possible if you put your mind to it. If you want to be the next Lobo or Swoopes and you love the game, stay committed. You never can tell where it will take you. You must be willing to work and sacrifice and if you are, you have the "love". What Kind of Athlete . . . Imagine for a moment that you had a little brother or sister, or a son or daughter, or a friend or just a character in a book . . . in a sports story. What kind of athlete would you want to read about? What kind of story? The perfect athlete? Highest jumper, fastest runner, best shooter, never misses, never tired? All easy wins. No pressure. No problems. No challenges. Just victory after overwhelming victory? I'd like that for my little brother or sister or friends. But it wouldn't be much of a story. It doesn't sound like anything but a fantasy. 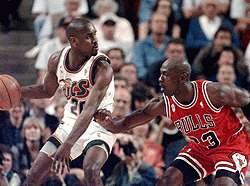 In the real sports world, even legends like Magic and Michael and Bird were known to miss shots in every game; they even got turnovers and back spasms, sprained ankles and torn ligaments. They all lost their share of games. The real sports world is filled with obstacles, problems, conflicts, adversity. Everything boils down to how an athlete learns to respond to those things. How resilient is your enthusiasm, how consistent your hustle, how focused your attention? Temperatures too hot/ too cold; ball too much air/ not enough; court too bright/ too dark; floor too slippery/ too much traction; refs cheat, coaches upset, score wrong. There's always something. But I would want my little brother or sister or friend or character to just be prepared mentally for everything, to be the same competitor under all conditions, to meet all challenges with a kind of joyous determination and a hint of a shrug that would seem to say "I expected this (whatever it is) but watch me anyway!" I'd like to think that MY brother or MY sister or MY friend or MY character would look upon every obstacle as a chance to show off the response of a champion. I would love to watch my little brother turn an obstacle into something I could watch and be proud of. That's MY kind of athlete. What kind of athlete . . . There are only so many things a coach can teach a player. Instinct is not one of them. This book teaches it -- in black and white. This book is a very good book for the serious player. It doesn't concentrate on fundamentals but on the more important and advanced aspects of the game. This book will help you improve your game tremendously, especialy in the mental area. I consider this to be my basketball bible. Click the book to the right to visit Amazon.com, the internet's largest bookstore, where you can purchase "Stuff: Good Players Should Know". "If you are under 18 years old, you have only lived about one fourth of your life. That means you have the remaining three fourths of your life to accomplish anything you want. Don't blow it. Don't do drugs. If you are doing them, stop it. Get some help. If you haven't experimented with drugs, don't start. Give yourself a chance to succeed and be all the wonderful things you can be." The difference between Champ and Chump is U.
Carl Joseph was the captain of his high school football team. He could dunk a basketball, was a power hitter in baseball, high jumped 5 feet 10 inches and also threw the shot and discus. Joseph was quite an all-around athlete . . . especially when you consider that he had only one leg. "A lot of people go through life wishing they could change this or change that. God gave me one leg, and I'm just happy and thankful to be healthy and to have done as much as I have." The epitome of the All-American boy, Carl Joseph accepted the gift of life as it was offered to him with all its limitations. He lives that life to the fullest. He is the perfect example for all athletes to follow. He never worried that he couldn't do certain things. It was mind over matter; he just went out and did the things he wanted to do. For his achievements, Carl Joseph received numerous awards, his most cherished being the Philadelphia Sports Writers 1982 Most Courageous Athlete Award. "I just wanted a chance to compete and I didn't want anybody feeling sorry for me, 'cause I sure wasn't feeling sorry for myself," Joseph said. "Ever since I was a kid, I could do anything I wanted to. One leg or two, it didn't make any difference to me. It's all in the mind. My mind always told me I could do things, so I just went out and did them. I never thought much about it. You keep trying and you always get there." to one day be just like you. after growing up like you. Rochester Democrat and Chronicle during the 1993-94 basketball season. Durham, N.C.--Here's the bad news for the rest of the NCAA Tournament field. There are no pictures anymore on Duke's locker room wall. This is significant, because there used to be. Until the night before this week's Florida State game, when a thoroughly aggravated Mike Krzyzewski answered his Blue Devils' lethargic practice by stripping them of their artwork. Down came the player photos. Down came the snapshots of past great moments that had been there for years as examples. Down came any reminder of Duke's recent glory. Left alone on the bulletin board was a simple card with a stern message: "There are no shortcuts to any place worth going." The redecoration may be worth remembering as a turning point. The next night, the Blue Devils crushed No. 6 Florida State, 98-75, in their most devastating display of basketball all season. They have had injuries (Grant Hill's absence with a bad toe). They have left their fans aghast by losing two in a row. But March is here, and they are starting to look ready. Again. "This was the first time we've put 40 minutes together," Bobby Hurley said of the Florida State game, which featured 16 of his assists. "It felt like last year." "I think a lot of us had been getting satisfied," forward Antonio Lang added. And the bare walls? "It's the idea of starting with nothing, and building something." "Sometimes," Krzyzewski said, "you have to play hungry." It has been no walk in the park for Duke, trying to live up to the past. Krzyzewski sometimes has been annoyed with the demands of the outside world, and how "the only way we can be successful is to be perfect. What a sad state of affairs if that takes place." He said that weeks ago. Since then, the Blue Devils have been looking for answers. They may have found them in time to make a run at a third straight NCAA title and boldly go where no team--save UCLA--has gone before. "I don't think we're there yet," Thomas Hill said, meaning Duke's full tournament steam. "But we're headed in that direction." This team has had to find its own identity. One step has been to handle the burden of great expectations. 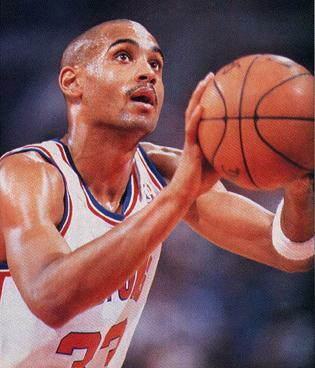 "It's tougher this year than it has been," Grant Hill said. "But I want to be on top. I want to be the team everyone is shooting at. That's what Duke has meant. "We're 21-5," Krzyzewski said. "We've handled it pretty well. But we're handling it better now. Achievement gives you confidence. Recognition of achievement gives you added confidence. These kids have achieved, but they haven't always been recognized for that achievement." Added Krzyzewski, "Last year's team started the season knowing everybody, having confidence in each other. This year, there was a gap between those three (Hurley and the Hills) and the rest of the team. We keep talking about closing the gap. It's closer now than it's ever been. But it takes time. It takes a tough schedule. And losing helps, too." Closed gap or not, those three veterans of so many Final Four wars must carry the fight against a tournament field seeking revenge. "No one else has three players who have been there like they have," Kansas coach Roy Williams said. "That means a lot." So, apparently, do bare walls. The Blue Devils went on to the NCAA title game where they lost to Arkansas.